Order Avocado green mattress that is a latex hybrid bed made using all-organic and sustainably sourced components. Available in a non-pillowtop option, it comes with a Medium-Firm feel. Read on to know more about Avocado mattress review here. The Avocado mattress is a medium-firm mattress that comes with natural cushioning layers that not only gives you the plush feel but also supports your spine optimally. We tried an Avocado Green Mattress, unfortunately too hard for our taste. Avocado Green picked it up and refunded our money quickly and with no fuss. The mattress is very well made and unlike memory foam, it doesn’t off-gas hazardous chemicals. Customer service also sets a high standard. There are few complaints available online regarding the firmness of the mattress. Users say that the bed is too firm and return it within the trial period. This issue is with side sleepers who feel they need a softer mattress. One user complained regarding Avocado mattress in Reddit that their hands went numb on their first day of sleeping. Users say that the middle zone of the bed feels the firmest and makes them feel like sleeping on a wooden log. Some users consider buying a mattress topper than returning the mattress. It features distinctive, hand-tufted rosettes made from wool. Organic cotton is Global Organic Textile Standard (GOTS) certified. Two upholstered handles adorn both side panels of the mattress, hand-sewn for a tight fit. A unique fire barrier of 100% natural hydrated silica protects both sides of your mattress. Currently, there are only two models available – Standard and Pillow-Top. You can choose the one that works great for you. A gentle yet firm mattress, Avocado comes with 11” thickness that is best suited for back and stomach sleepers. It is a medium-firm mattress that alleviates stress from the pressure points. It is a fantastic option if you are suffering from back pain or arthritis and need firm support for your body. It is an initiative from Avocado mattress to promote a greener earth. The base layer of the bed is filled with ergonomic 16 gauge pocketed coils of *” density to retain the bounciness while giving proper support. The top and final layer are an additional 1” of High-density Dunlop Latex. At the top, you will find 1/2” Joma New Zealand Wool that is not only soft but oozes comfort and feels luxurious. The natural fiber is breathable and absorbs heat to maintain a comfortable sleeping temperature. It also resists moisture thus keeping your mattress fresh. This natural New Zealand wool is a fire retardant in itself. The company also uses naturally hydrated silica that is made using Opal stone that protects your mattress. It means your mattress is free of chemical retardants that cause hair loss, respiratory disorder, skin disease, and other neurological damage. With hand-tufted rosettes, the Avocado Mattress is soft to touch and gives you a luxurious feel to sleep on. The Pillow-top Dunlop mattress is 13” thick in total. It comes with ½” of Joma New Zealand Wool, 8” of pocketed spring coils, 4” of Dunlop latex rubber foam and an additional 1” of the Dunlop foam. It makes 13” of the pillow-top mattress which is an upgraded version of the standard mattress. It makes it an excellent bed for side sleepers, back sleepers, athletes, or for just anyone who want to get the foam to feel without sinking too much. Switch from wool to cotton, If you want to go completely Vegan on your Avocado mattress. The Vegan Avocado Mattress features 100% natural latex rubber, comes with certified organic cotton cover and up to 1,414 pocketed support coils. There are no polyurethane foams or toxic fire retardants. The features are just the same as Avocado Green Mattress, but it uses cotton instead of wool. The Avocado Pillowtop mattress comes with medium-firmness. Based on the sleeper preference and weight, it might differ. For instance, a sleeper who is on the heavier side might feel it comfortable and get optimal support. If you on the lighter hand, then you may think it is too firm to sleep on. The Avocado mattress cover is button-tufted and is made using 100% organic cotton. It is breathable and is soft to touch. The mattress comes with a thickness of 13” thick in total. The comfort layer is 5” of natural Dunlop latex (3” + 2” with the pillowtop). A durable material, it provides excellent pressure relief and offers excellent bounce. The support layer is an ergonomic system of individually wrapped coils. The coils are constructed keeping in mind zone support meaning you get extra support around the edges which is equally crucial for a quality mattress. A very advanced support system, it is built to be durable. As a result, it works efficiently for heavier people. Many users and review websites have tested Avocado mattress for know which types of sleepers will benefit the most with this mattress. Back sleepers – Reviews say that the weight is evenly distributed when you sleep on the mattress surface. The comfort layers and the cover does an excellent job of providing lumbar support. The bounce also makes it easy to move around and switch positions (especially if you are a combination sleeper). Side sleepers – As per reviews, people will experience the formation of pressure points at the shoulders and hips. It means that people will need softer beds which will give you more cushion relief to alleviate strain on these pressure points. Stomach – As per reviews, testers say that they found a right amount of relief in this position. The buoyant lift aligns the spine perfectly and reduces strain on the body. It keeps the shoulders in an even line with the hips while taking the pressure from your stomach so that you can breathe easy. Personal isolation is a crucial factor when you are a couple. You don’t want to disturb by your partner whenever he/she hops in and out of bed at night. While latex doesn’t work like memory foam in delivering personal isolation, it still does a decent job in resisting motion transfer. Testers claim that they get a lot of support. The double stitched and evenly distributed coils helps you to utilize all the space of the mattress surface so that you can sleep all the way without losing balance. With any mattress, there is bound to be a certain smell as it is shipped directly from the manufacturing unit. If at all you notice any smell while unboxing Avocado mattress, leave it open in a well-ventilated room for a few hours. You will see that the smell dissipates. That said, Avocado mattress foams are CertiPUR-US certified. It means they contain low VOCs and are free from PBDEs that can be an allergen to the body. So far, there have been no reports of any foul odor with Avocado mattress. Off-gassing is usually an issue seen with memory foam mattress. The Avocado mattress does NOT use memory foam or polyurethane foam layers. The filling materials in Avocado mattress are natural latex foam, natural wool fiber, and organic cotton plus naturally hydrated silica. The silica serves as a chemical-free fire barrier. Even the mattress ticking is made using GOTS certified organic cotton that includes a small percentage of polyfiber for flexibility and durability. It is to match the 25-year warranty. As a result, off-gassing won’t be an issue with Avocado mattress. Green Pillows – is a medium-plush pillow that is Greenguard Gold certified, vegan and is handmade in LA. A non-toxic-pillow, it is made from natural latex and natural Kapok fill and comes with a certified organic cotton cover. Mattress toppers – it features natural Dunlop latex and New Zealand wool. It is hand-stitched with reinforced seams that comes with an internally quilted ticking made with certified organic cotton. It is available in Plush and Firm type. Natural wood bed frame – made using 100% reclaimed wood, it is handmade in LA and is free from VOCs. Easy to assemble, you don’t need any tools and can DIY without any hassles. The company also offers in-home delivery and set up free of cost. Eco wood bed frame – another bed frame that is 100% environment-friendly, Avocado green mattress is an excellent product that is handmade in Los Angeles. Free from VOCs, it is available for free setup and installation. Why should you Buy Avocado Mattress? Planning to buy Avocado Green Mattress? Here is a brief of why you should invest in an Avocado mattress. 100% all-natural materials are used in making Avocado Green Mattress. The mattresses are handcrafted and manufactured in the USA (in California). Natural wool layers give you soft, luxurious, and optimum comfort to sleep on. The natural Dunlop latex rubber foam is eco-friendly and offers excellent durability. The combination of innerspring coils and Dunlop layer offer you great bounciness without sinking you in. Avocado hybrid mattress suits everyone with different sleeping preferences. It is anti-microbial, fights dust mites, and balances the temperature. The button-tufted mattress covers are made using certified organic and wicks away moisture. Get 100-nights sleep trial with your Avocado Mattress which will give you ample time to gauge the effectiveness of the mattress. The company offers free shipping and returns anywhere in the USA. Avocado green mattress comes with a 25-year warranty period. All the Avocado Green Mattresses are free of polyurethane foam, memory foam, and synthetic foam. There are no chemical flame retardants used. The fire retardants used are 100% natural. Two great belts are available on both sides of the mattress for easy maneuvering. This natural and safe product contains no petroleum-based polyurethane foam, toxic flame retardants, dangerous pesticides, and risk from volatile chemicals and gasses. Handcrafted in the USA, this bed sells directly to customers, cutting mediators and passing on the savings. For convenience, this mattress comes compressed in a box and delivered to your doorstep. Free shipping, 100-night sleep trial, 10-year warranty, easy financing with Affirm, and in-home delivery & setup for just $99 more are added features. All products of Avocado Green Mattress are eco-friendly certified and carry the following certifications. OEKO-TEX certified – worldwide consistent, independent testing and certification system for all the textile products – which certifies that the wool is free from allergenic dyes, chlorinated phenols, formaldehyde, heavy metals, and other chemicals that are harmful to the skin. Green America Certified – awarded to companies that meet or exceed the standards for social and environmental responsibility. Apart from these certifications, Avocado Green Mattress also takes the initiative in reducing carbon footprint and devotes 1% of the revenues are donated to environmental nonprofits. Natural & Organic – This Avocado green mattress contains 100% natural latex, the greenest, healthy and luxuriously supportive foam. Pure rubber sap from Hevea Brasiliensis trees in Asia is harvested followed by the traditional Dunlop manufacturing process to produce clean and green material that’s amazingly resilient, supportive and durable. Breathable – Synthetic foams and memory foams lock in body heat and radiate it back, resulting in the uncomfortable hot surface. In contrast, this natural latex allows air to circulate naturally. It whisks away body heat and helps regulate body temperature to ensure a calm, restorative sleep. Hypoallergenic – Avocado Mattress is a safe “haven” of resistance. This natural latex is inherently resistant to mold, mildew, and bacteria, and acts as a natural barrier to dust mites. Eco-INSTITUT Certified – This 100% natural latex carries the prestigious and independent certification from the Eco-INSTITUT in Cologne, Germany. It means the latex has been tested and proven to exceed the legal requirements for quality and health harmlessness of latex and mattress products. It does not contain volatile organic compounds, persistent organic compounds, heavy metals, pesticides, formaldehyde or phthalates. Odor Free – Natural latex is an odor-free product. Unlike memory foam or petroleum-based polyurethane foams, it does not off-gas or produces chemical odors. Environment-Friendly – The pure, natural latex is one of the most eco-friendly mattress materials available. Despite being so highly durable and resilient, it is biodegradable. Since olden days, people have used wool in bedding to stay comfortable and cool. It’s unique and amazing properties which stay warm when you are cold and fresh when you’re hot. It is because the inherent structure of wool fibers allows for large volumes of air, giving natural insulation, elasticity, and resilience. It can also absorb a considerable amount of water without ever feeling wet, offering natural temperature-regulating properties that complement Avocado natural latex foam. It contains two ½ inch layers of pure, naturally crimped Joma wool from New Zealand into the lining and between the layers of every mattress. To complement the natural comfort layers, Avocado mattress also features an 8” support layer of 681-1,303 individually pocketed comfort coils to ensure your proper spinal alignment and balance. Encased in their own fabric pockets in 3 distinct zones, they float independently to reduce motion transfer, providing optimal and personal ergonomic and joint support. It also contours to your body shape, distribute weight evenly and relieve pressure. And most importantly, they offer better edge support, making this mattress extremely durable. Cleaning the natural latex mattress is comfortable. You don’t need any harsh chemicals. There are common household ingredients through which you can keep your bed fresh and free from mold. Mild detergents or isopropyl alcohol work well. Accompany it with small amounts of cold water. Always air dry the mattress by placing it outside as the natural latex are covered completely. So they are not subjected to direct sunlight. Do not steam clean your mattress as they deliver excessive heat which can over-bake the natural latex. Water is not harmful to latex so you can use them as long as you absorb the excess water using a light-colored sponge or white rag to blot the water. Do not rub it. Strip the bed down and sprinkle a layer of baking soda on the entire mattress. Leave it for around 30 minutes. Baking soda is an excellent product to get rid of any dirt, moisture, and odors from fabric and its materials beneath it such as wool, cotton, and latex. Use a vacuum cleaner to remove all the baking soda. Use a few drops of favorite essential oils in the baking soda before you sprinkle it if you want to add a dash of fragrance. Lavender and Lemon oil are best recommended. 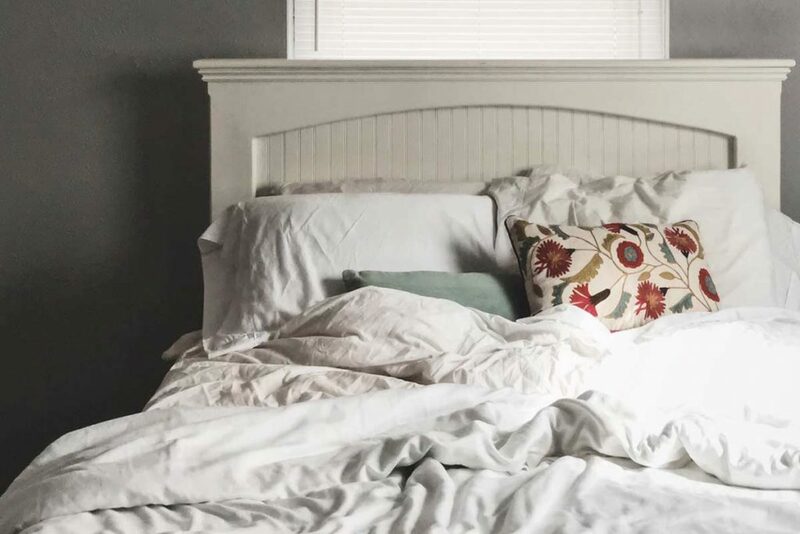 If you want to remove urine, dirt, and blood stain from your bed, try this remedy. To remove light stains, use this solution gently on the fabric of the mattress. Let it air dry. Blot the area using a dry white rag or scrape off the residue. Alternatively, you can use vinegar and baking soda as well. NOTE: Always test DIY stain remover in a small area first. As you are using them on natural fiber, the natural stain remover might whiten the area more than intended. It will give you a bleach spot. Hence, it is necessary that you proceed slowly. Always use a natural mattress protector on the natural mattress. If you are going to use a mattress without a mattress protector and with a child who wets the bed, we advise you clean it right away. It is because longer the urine remains on the mattress, harder it’s going to be to remove it. Use an enzymatic cleaner to remove any stains of urine. That’s because it is the only thing that will break down the odor-causing uric acid. It will truly get your mattress clean. Strip the bedding off the mattress immediately. Blot the urine with towels. Sprinkle the baking soda across the wet area to absorb any urine. Blot the mattress dry again. Sprinkle it with baking soda again. Let the mattress air dry overnight. In the morning, vacuum up the baking soda and other residues. Prop the mattress up and let it dry under the sun completely. Pour a few drops of hydrogen peroxide in the affected area while ensuring that you get the bubbling action when it hits the blood. If you don’t have hydrogen peroxide, meat tenderizer works as well. Blot the peroxide using a dry towel once the bubbling stops. Blot the area first using a cool, wet towel. Then use a dry towel to absorb all the excess moisture. Leave it to air dry under the sun directly or indirectly. Grab a trash bag and clean off any solids from the bed. We do hope there might be a mattress cover or protector. Once you have cleared out the solids, blot any fluids off the mattress using a dry towel. Sprinkle baking soda on the affected area. Use an enzyme cleaner. Spray the area and let it sit for a few minutes. This time sprinkle more baking soda across the top. Vacuum the baking soda and other residues in the morning. 8 out of 10 owner experiences say that customers have had a positive experience with Avocado regardless of whether they like it or not. The avocado was started in 2015. The avocado mattress has a brick and mortar location in Hoboken, New Jersey. It is not available in other showrooms. If you carry a lot of weight, then Avocado offers you that the right firmness level that will help you to prove different than what you may be used to. The combination of Dunlop foam layers and innersprings offer you a great solution. The careful zoning relieves pressure points to keep you equally comfortable through all areas of the body enhancing quality sleep. Where to buy Avocado green mattress for sale? You can buy Avocado mattress for sale from the official website. Are there any Avocado mattress showroom? No. Avocado mattress is not available on any showroom or any other mattress retail stores. How to use Avocado mattress coupon codes? The company offers a Sleepwell Sale of $150 OFF on purchase of Avocado Green Mattress. So you don’t have to look for any discount coupon codes as the company offers great discounts and savings. Does Avocado mattress work on an adjustable frame? Absolutely. Unlike what many reviews say, Avocado green mattress works on an adjustable frame. The Avocado mattress is not registered with the Better Business Bureau. Avocado Mattress is indeed not a scam. However, questionable customer service has many people to lead people to think whether the company is a scam. Low refunds, charging for the mattress before shipping, lack of phone number are few of the flaws that the company needs to work on. Of course, there are many satisfied customers as well who have benefited a lot from Avocado mattress. But these are crucial points that the company needs to work on or else they will lose the customers. The Avocado mattress is made of natural materials, so the chances of bugs or mites are rare. However, it is equally important that you take care of your mattress. You can use mattress protector that will prolong the life of your bed by preventing spills and dirt. Yes. The Avocado mattress is specially designed for treating back pain problems. The medium-firm mattress corrects the spine alignment and gets rid of any stress in the pressure points. It will give you great relief from any pain in the neck or back area. Sure. The products of Avocado mattress are 100% environment-friendly. An excellent initiative towards greener earth, Avocado mattresses are natural green mattresses that are organic and safe for you and your family. There are no shipping and delivery charges. However, if you want in-home delivery, you need to pay an additional amount. As per the company website, they manufacture the mattress only upon confirming your order. It takes about 7-12 days to make a mattress and shipping calls for another nine days. It can impact the delivery. So make sure that you give the company at least 3-4 weeks for delivering it. For those who want to enlighten themselves of helpful guides, tips & tricks, Avocado mattress offers you helpful blogs which will keep you updated with the latest health guides. All you have to do is subscribe to their newsletters or follow them on Facebook, Instagram page for recent news. Currently, there are only a couple of downsides which the company needs to work on. For instance, charging the buyer before the product is even shipped!!! Another major flaw is the lack of customer support phone number. There is a form available on the official website which you need to fill if you need a reply. Unfortunately, the only way to request a call back is to fill the contact form as well. It is a huge drawback as sleepers complain that even after requesting a callback, the customer service does not call back. If Avocado Mattress works on this issue, they would be many better-satisfied customers. The Avocado mattress is currently one of the best mattress brands that offer natural mattresses online at the best price. They have done a commendable job of combining traditional coils, tufting with natural latex, wool and organic cotton. A high-quality mattress, latex is quite a durable product that won’t have any issues with sinkage over time.